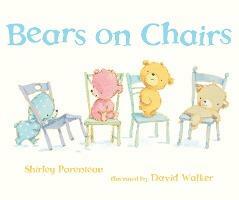 Can five bears share four chairs? The infectious rhymes and easy charm of this winsome read-aloud will make young listeners sit up and take notice. Four chairs. Four adorable bears. All is well until Big Brown Bear shows up what a stare! and wants a seat. Can these clever bears put their heads together (among other things) and make space for one more? With endearing, expressive illustrations and a sustained rhyme in every line, here is a cozy tale that makes it clear there is room for all." Rhyming text is simple enough for a preschool audience, and the lesson the bears model about sharing, though obvious, will be welcomed by many teachers and parents. David Walker has illustrated several children s books, including DOMINO by Claire Masurel and FLIP, FLAP, FLY! by Phyllis Root. He lives in Chapel Hill, North Carolina."